Asters deliver late season color to the garden. Their daisy-like blooms are nice in mixed borders and as cut flowers. Many perennial varieties are available. They form clumps of upright stems, from 12 to 40 inches tall, with small, lance-shaped leaves. Asters are native to most of the northern hemisphere, and are extremely easy to grow. Most are grown in zones 3 to 8. They prefer evenly moist but well drained, fertile soil in full or part sun. To help prevent powdery mildew and other fungal conditions, allow plenty of air circulation. Space plants at about half their height. Feed asters in the spring with a topdressing of an organic fertilizer such as compost. To keep plants compact and encourage branching, pinch back stem tips in spring and again in early summer. But don't pinch them after June 15th in the North, or July 1st in the South, or you may remove the flower buds. Divide plants every 2 to 3 years to keep them vigorous. 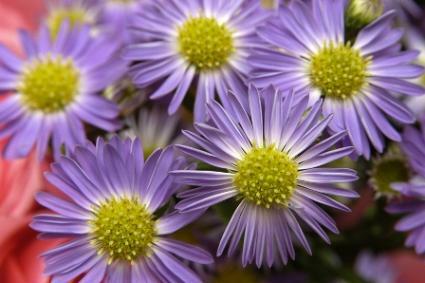 Remove flowers after they fade to prevent self-seeding: hybrid asters do not come true to seed. If you grow wild species, you may decide to let them self seed. White wood aster (A. divaricatus) is a native North American species that grows about 18 inches tall by 18 inches wide. Purplish-black stems grow in a distinct zig-zag pattern. Plants produce clouds of 1-inch flowers from midsummer through fall. This species is shade tolerant. Heath aster (A. ericoides) is a North American species that is also quite disease resistant. Plants range in height from 12 to 36 inches and have small, needle-like leaves. They produce masses of tiny flowers in the fall. 'Blue Star' is sky blue; 'Pink Haze' and 'Esther' are pink. Calico aster (A. laterifolius) is another North American native with good disease resistance. The foliage has an attractive reddish tinge throughout the summer. Plants reach about 30 inches and are often wider than they are tall. Clouds of tiny, starry flowers cover the plants in fall. 'Prince' is a popular cultivar with pinkish white flowers. Frikart's aster (A. x frikartii) is popular because of its long bloom period-from midsummer into fall. Flowers are fragrant and make excellent cut flowers. Growing 24 to 36 inches tall, these asters are very resistant to powdery mildew. 'Monch' and 'Wunder von Stafa' are the most popular cultivars and both have lavender-blue flowers. Bigleaf aster(A. macrophylla) is a woodland wildflower that prefers partial shade. It is sometimes grown as a groundcover. Plants form mounds of large, basal leaves. One-inch flowers appear in fall. New England aster (A. novae-angliae)is a much-hybridized North American species that grows 18 to 48 inches high and spreads 24 to 48 inches. Flowers have 1 ½- to 2- inch wide heads and are good as cut flowers. Cultivars include 'Alma Potschke', which grows to 36 inches high with salmon rose flowers; 'Hella Lacy', which grows to 42 inches with royal purple flowers; and 'Purple Dome', a compact, 18-inch plant with deep purple flowers. New York aster(A. novi-belgii) is another North American species offering many selections ranging from 12 to 48 inches high by 24 to 48 inches tall. The flower heads are usually just 1 to 1 ½ inches wide and the leaves are much narrower than those of New England aster. New York asters tend to be more susceptible to powdery mildew and wilt and are not as good for cutting. Some selections include 'Fellowship', which bears deep pink 3-inch blooms; and 'Bonningdale White', which bears white flowers on 48-inch tall plants. Low-growing selections include lavender-blooming 'Professor Anton Kippenburg' and white-flowered 'Niobe'. Tatarian aster (A. tataricus) is a tough plant that can withstand drought. A giant in the garden, the species can grow 5 to 8 feet tall, but seldom needs staking. Lavender flowers appear in mid to late fall. 'Jindai' is a cultivar that only grows 4 to 5 feet tall. Plant it at the back of the border to hide its barren lower stems. Plant tall varieties in the back of the garden with other perennials such as Bugbane (Cimicifuga), Black-eyed Susans (Rudbeckia), Coneflowers (Echinacea), and Ornamental grasses. More compact varieties work well with chrysanthemums and daylilies. Varieties that tolerate shade look great among native wildflowers and ferns.